A couple of days ago, we got our first glimpse at what the 2017 Google Pixel XL 2 would look like. A design that revisits last year's look with a partially-covered-by-glass back and adopts the new trends of super-thin bezels and 2:1 screen aspect ratio. 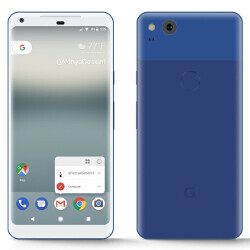 After that leak made its rounds, serial leakster Benjamin Geskin sidetracked from leaking iPhone 8 bits for a while and made a couple of renders that showcase how the Pixel XL 2 would look in silver and blue. Then, he went ahead and visualized a size comparison. 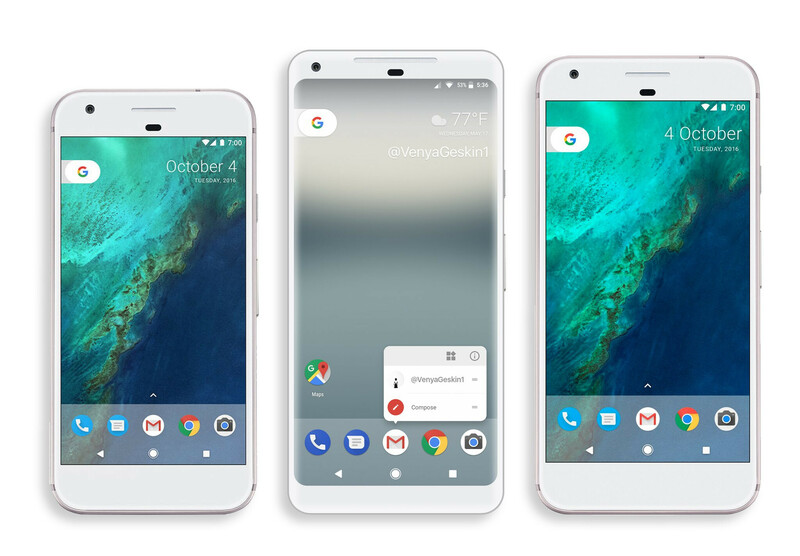 In the below image, which is based on everything we (think we) know so far about the Pixel XL 2, we can see the phone laid between the 5-inch gen 1 Pixel and the 5.5-inch Pixel XL. So, yeah, that alleged Pixel XL 2 might have a 6-inch display, but due to the 18:9 ratio and the super-thin bezels, it will barely be bigger than the current XL. At least based on the limited information we have now. Omg, all new phones from now on will just copy the S8. This looks exactly like the S8. Dem remote controls these days. @keithtae *cough LG G6, *cough Nice work PA, buggy comment section. This doesn't look EXACTLY like the S8. Go check your eyes and brain. It looks like a refined G6. LG is probably making it. My next phone. Glad I waited. f**k you, retarded lightsaber screen ratio. It's like having laptop and a 16:9 thing happening all over again, like a s**tty deja vu. Looks fantastic. I am sold if it is a G6 with pixel software. The G6 would have cleaned up this year if Samsung didn't have to save their reputation by going all out with the GS8. And if the G6 had a SD 835. The Xperia XZ premium and the HTC U11 are ridiculously huge, the Note 8 will probably me much more compact than both with a much larger display. So so far 1. GS8 2. LG G6 This will take at least 2. If it looks this good. Wrong proportions. In the images the Pixel XL 2 screen has the same width as the Pixel XL, which at the 18:9 aspect ratio would make it a 6.2" display like the Galaxy S8 Plus. The phone will be smaller than it looks here. Lazy job by this guy, Benjamin Geskin. Confuzed on why people are against 18:9?? Everyone is absolutely right! Looks very similar to the LG G6 vs Galaxy S8. Galaxy S8 In my opinion has smoother curves and still looks a tad bit better. Yeah, all future smartphone designs will somehow mimic the Galaxy S8/ LG G6 in terms of bezel less design and thinness of of phone. That's what manufacturers thing consumers want, and that's also what will sell smartphones.